It was a question that dominated the 2013/14 season and now it is once again making the headlines. Will Arsène Wenger extend his contract or will he leave Arsenal? In 2013 the calls for Wenger to go were not as vocal as they are now. The complaints lobbied at the Frenchman were over the club’s trophy drought. After winning the FA Cup in 2005 the cabinet at the Emirates was bare and, with the stadium bill paid off, the excuses were running out. At the time Wenger batted away questions about his contract, insisting it would be resolved at the end of the season. Many thought he may go if he achieved success, leaving the club he loved on a high after years of service. But there also remained the argument that lifting a trophy would revitalise Wenger and give him the taste to carry on. As it turned, the latter turned out to be the case. It is only now that we have learned how close Wenger was to going. Speaking in a press conference earlier this year he revealed for the first time that he didn’t know if he would remain at Arsenal in 2014 had the club not won the FA Cup. His contract was expiring that summer and he did not sign an extension until a full two weeks after the final. Speaking in February of this year, Wenger said: “If we had lost it, I don’t know [if I would have stayed.] Usually I respect my contracts and I fight for everything. “It would have been a problem had we not won because it would have been a massive disappointment for everybody. 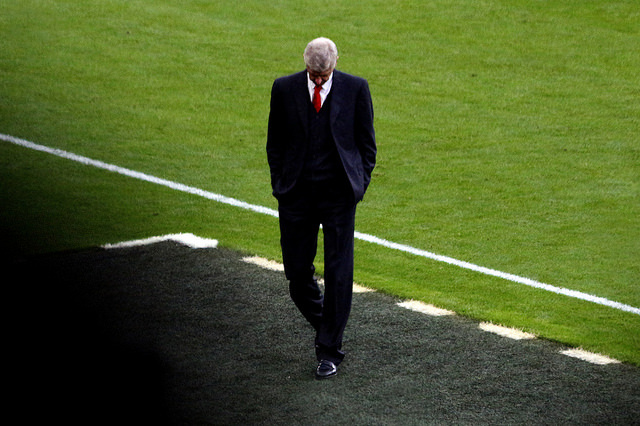 Now, Arsenal are once again at the same point where Wenger’s future is under intense scrutiny. And just as he said was unsure whether he would stay at the end of his contract in 2014, it feels very much like Wenger is facing the same dilemma. But this time, the stakes are higher. As stated, the unrest among fans and calls for Wenger to go are certainly greater than they were in 2014. It meant that back then supporters could be appeased by FA Cup success. That, however, will no longer suffice. If Wenger is to stay beyond the end of his contract at the end of next summer it feels very much like he has to win the Premier League, or failing that achieve greater success in the Champions League. It is only under those circumstances that you can see him staying. Wenger has been very adamant about staying, regularly highlighting the point that he always honours his contract. What is more, there is little to no chance of the board sacking him. And so it brings us back to this element of déjà vu, where with one year to go on Wenger’s contract no one really knows what the future holds. And that includes Wenger. For just as he recently admitted that he didn’t know if he would stay in 2014, you get the feeling he is in the same Catch 22. Undoubtedly he would love to stay, but he is still a realist and someone who loves the club. If he isn’t the man to deliver success then I think he would go at the end of his contract. However, it won’t stop this final season being one of déjà vu and just as we did in 2014 we may have to wait until the end of May to find out how this story will continue. Simon Collings is a journalist in addition to being a Regular Columnist here at #ABW – check him out on Twitter at @sr_collings. He is also part of a Premier League Podcast called All About the 3 Points which we definitely think you should check out. Have you listened to the latest Podcast and Radio show? Well crack on! This entry was posted in NewsNow, The Bergy Blog and tagged AFC, Arsenal, Arsene Wenger, Champions League, FA Cup, Finances, Gunners, Premier League, Wenger. Bookmark the permalink.